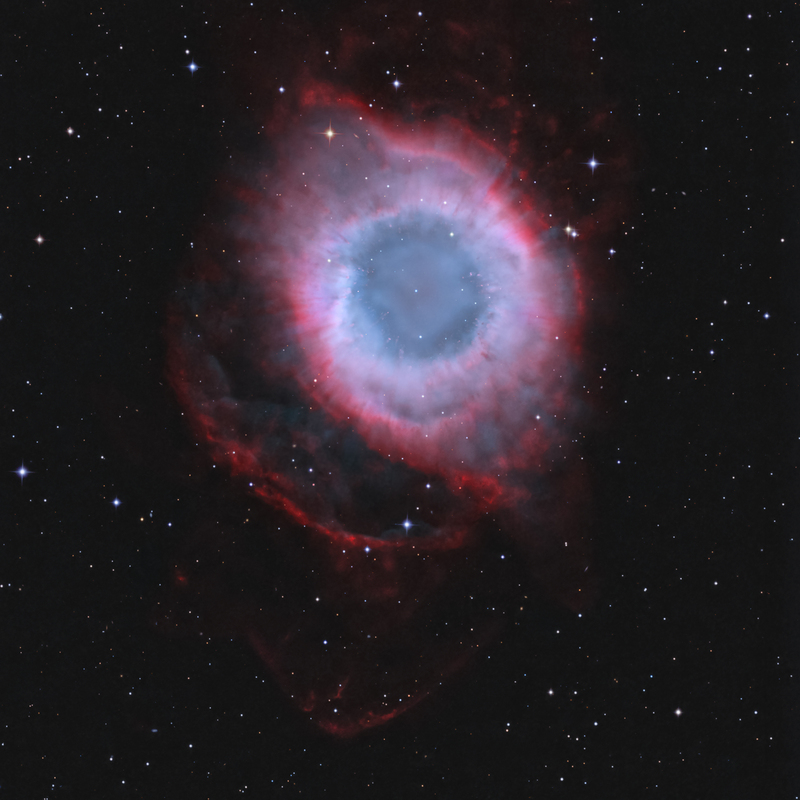 The Helix nebula, NGC 7293 (Caldwell 63), in Aquarius is one of the most studied objects in the sky. 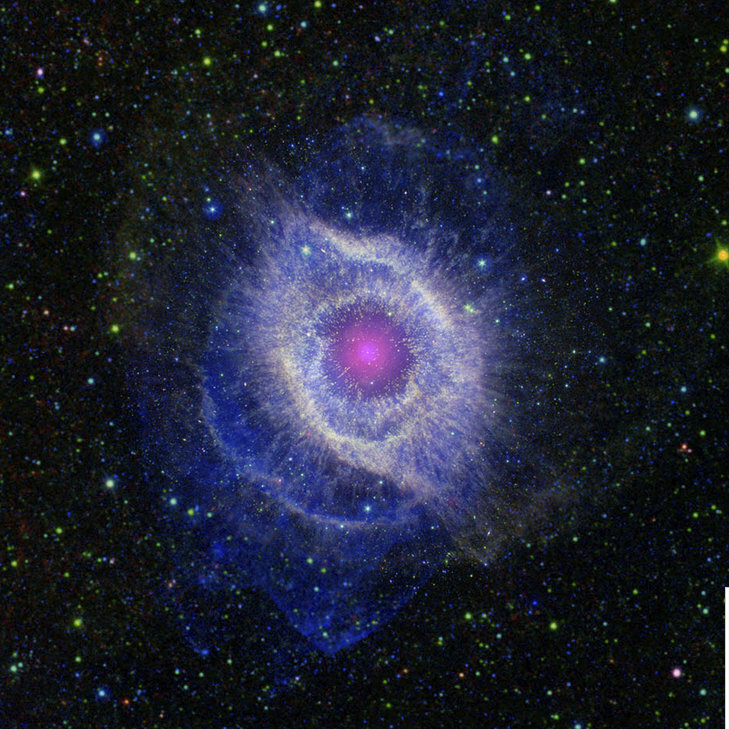 It appears quite large because it is one of the closest planetary nebula (PN) to Earth at a distance of about 700 light years. It is bright and huge, being almost 3 light years across. North is toward the left in the above image that spans 35′ x 35′. The bright core is about 12′ x 20′. There is a bright "rim" toward the lower left (NE) that increases the apparent width to about 17′. Finally there is a rarely imaged conical projection beyond the "rim" toward the bottom of the image that is extremely weak. That, along with some additional emission near the top of the image expands the length to about 30′. The faint conical projection required many hours of exposure with the high contrast of our 3 nm hydrogen-alpha (H-a) filter. Some technical articles have referred to this as a bow shock, signifying that the Helix is moving through and interacting with the interstellar medium (ISM). The region between the "rim" and bright core contains blue-green oxygen emission as brought out by our 3 nm OIII narrowband filter. In addition, there is a fascinating radial pattern defined by oxygen emission in the bright portion of the PN that we refer to as OIII spokes. Lastly, there are also knots projecting into the blue-green central region defined primarily by the H-a filter (click on the image to zoom in to see these). These knots are also rich in nitrogen (NII). They are a thin stream of material with a bulbous end referred to as a cometary knot. The Helix was the first PN discovered to have these knots, which are considered to be about the size of our entire solar system! The Helix is thought to be aobut 10,000 years old. The faint conical projection is clearly defined in the Spitzer/Galex image below that combines both ultraviolet and infrared data. 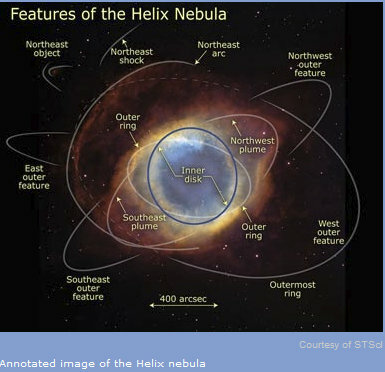 The following annotated image from the STSci shows the complexity of features that comprise the Helix Nebula. I wish to acknowledge my observatory partner, Chris Purves, for providing the data that I processed.